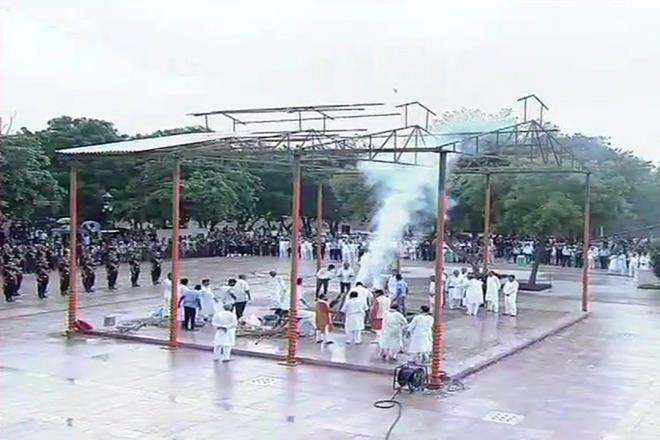 New Delhi, Aug 17: Former Prime Minister Atal Bihari Vajpayee, who passed away here at AIIMS on Thursday at age 93, was on Friday cremated with full military honours at Rashtriya Smriti Sthal, where people turned out in tens of thousands to pay their final tributes. 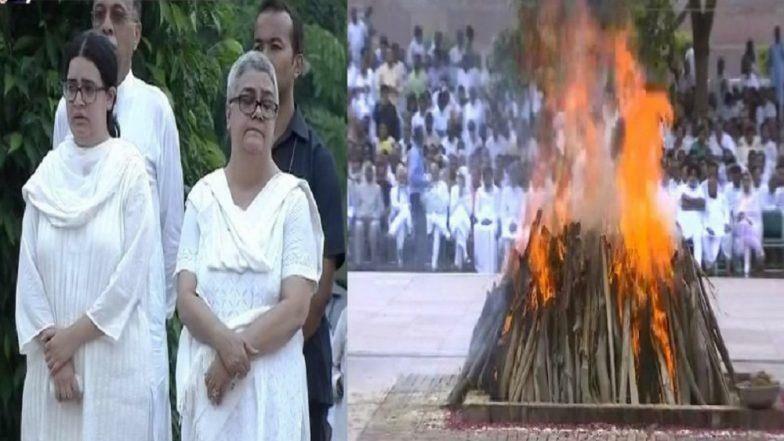 Vajpayee's foster-daughter Namita lit the funeral pyre amidst the chanting of vedic hymns and firing of a 21-gun salute by soldiers. President Ram Nath Kovind, Vice President M. Venkaiah Naidu and Prime Minister Narendra Modi led a galaxy of political leaders cutting across party lines and foreign dignitaries joined the rest of the nation in bidding adieu to the departed leader at the Rashtriya Smriti Sthal, a designated spot for the last rites of Presidents, Vice Presidents and Prime Ministers, on the banks of Yamuna river. In keeping with the military honours, three service chiefs placed wreaths on the body of Vajpayee before leaders paid their floral tributes. The tricolour that was wrapped around Vajpayee's body was removed and given to his foster granddaughter Niharika after which the body was handed over to the family for last rites. Bhutan King Jigme Khesar Namgyel Wangchuk and former Afghanistan President Hamid Karzai led foreign dignitaries including Nepal's Minister for Foreign Affairs Pradeep Kumar Gyawali, Sri Lanka's Acting Foreign Minister Lakshman Kiriella and Bangladesh Foreign Minister Abul Hassan Mahmood Ali in paying homage. Former Jammu and Kashmir Chief Minister and PDP leader Mehbooba Mufti, Bihar Chief Minister Nitish Kumar, Congress leaders Ghulam Nabi Azad, Mallikarjun Kharge and Anand Sharma, Lok Sabha Deputy Speker M. Thambidurai, former Union Minister A. Raja, MDMK chief Vaiko and TMC leader Dinesh Trivedi were among who witnessed the performance of the last rites. A few thousand people, some of whom chanted slogans hailing the late leader, thronged the Smriti Sthal as the last rites took place. Earlier, tens of thousands of commoners joined Modi and BJP President Amit Shah in the final journey to bid adieu to Vajpayee as the former Prime Minister's body was being taken to Rashtriya Smriti Sthal. The country observed a seven-day state mourning as a mark of respect for the leader was decorated with Bharat Ratna and was very popular. The tricolour is flying half-staff.